1دانشجوی دکتری تخصصی روانشناسی عمومی، گروه روانشناسی، دانشکده ادبیات و علوم انسانی، دانشگاه لرستان، خرم‌آباد، ایران. 2دانشیار، گروه روانشناسی، دانشکده ادبیات و علوم انسانی، دانشگاه لرستان، خرم آباد، ایران. 3استادیار، گروه روانشناسی، دانشکده ادبیات و علوم انسانی، دانشگاه لرستان، خرم آباد، ایران. مقدمه: اضطراب و افسردگی از علائم شایع اختلال سندرم روده تحریک‌پذیر به شمار می‌آید. شناخت درمانی مبتنی بر ذهن آگاهی می­تواند یکی از مداخلات مؤثر در کاهش اضطراب و افسردگی باشد. هدف پژوهش حاضر تعیین اثربخشی شناخت درمانی مبتنی بر ذهن‍آگاهی بر اضطراب و افسردگی بیماران مبتلا به این اختلال بود. مواد و روش‌ها: پژوهش حاضر از نوع کارآزمایی بالینی آموزشی و جامعه پژوهش شامل بیماران مبتلا به سندرم روده تحریک‌پذیر مراجعه‌کننده به مراکز درمانی شهر کرمانشاه بود. پس از انطباق با ملاک‌های تشخیصی Rome-III و تکمیل پرسشنامه اضطراب و افسردگی Beck، تعداد 40 نفر آزمودنی به عنوان نمونه انتخاب شدند. آزمودنی‌ها به روش تصادفی در دو گروه آزمایشی و کنترل (20 نفر برای هر گروه) جایگزین شدند. 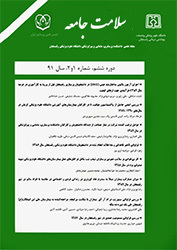 بعد از اتمام دوره 8 جلسه‌ای شناخت درمانی مبتنی بر ذهن‍آگاهی در گروه آزمایشی و جمع­آوری نمرات در مرحله پس­آزمون، داده­ها با استفاده از آزمون آماری تحلیل کواریانس مورد تجزیه و تحلیل قرار گرفتند. نتیجه­ گیری: این مداخله به عنوان درمانی مؤثر، می­تواند در بهبود نشانه‌های افسردگی بیماران مبتلا به سندرم روده تحریک‌پذیر به کار برده شود. شاید بتوان با ارتقای تکنیک­های این درمان، به بهبود بیشتر اضطراب در این بیماران امیدوار بود. 1PhD student, Dept of Psychology, Faculty of Literature and Humanities, University of Lorestan, Khorramabad, Iran. 3Assistant Prof, Dept of Psychology, Department of Psychology, Faculty of Literature and Humanities, University of Lorestan, Khorramabad, Iran. Introduction: Anxiety and depression are of common symptoms in patients with irritable bowel syndrome. Mindfulness-based cognitive therapy can be one of the effective interventions to reduce anxiety and depression. The aim of this study was to determine the efficacy of mindfulness-based cognitive therapy on anxiety and depression in patients suffering from irritable bowel syndrome. Materials and Methods: This research was an educational clinical trial study and the study population consisted of patients with irritable bowel syndrome referring to Kermanshah health centers. After compliance with the Rome-III diagnostic criteria and completed the Beck Anxiety Inventory and Beck depression Inventory, 40 patients was selected and randomly assigned in experimental and control groups (20 patients for each group). At the end of 8 sessions of cognitive therapy based on mind-consciousness for experimental group the post-test data was collected and analyzed by covariance analysis. Results: Findings of this study indicated that mindfulness therapy had a significant effect on reducing depression in patients with irritable bowel syndrome (p=0.000, F=19.99). Although this intervention had a positive effect on anxiety but it was not significant (F=0.011, p=0.918). Conclusion: Depression in patients with irritable bowel syndrome may be relieved by mindfulness-based cognitive therapy. Modification of this technique is possible able to reduce the severity of anxiety in these patients. Sadock BJ, Sadock VA, Ruiz P. Kaplan and Sadock's Synopsis of Psychiatry. 11nd ed. Philadelphia:Lippincott Williams and Wilkins;2015:813-38. Grundmann O, Yoon SL. Irritable bowel syndrome: epidemiology, diagnosis and treatment: an update for health-care practitioners. JGH 2010;25(4):691-9. Ghannadi K, Emami R, Bashashati M, Tarrahi M-J, Attarian S. Irritable bowel syndrome: an epidemiological study from the west of Iran. IJG 2005;24(5):225-6. Yoon SL, Grundmann O, Koepp L, Farrell L. Management of irritable bowel syndrome (IBS) in adults: conventional and complementary/alternative approaches. AMR 2011;16(2):134-51. Son Y-J, Jun E-Y, Park JH. Prevalence and risk factors of irritable bowel syndrome in Korean adolescent girls: a school-based study. IJNS 2009;46(1):77-85. Posserud I, Svedlund J, Wallin J, Simrén M. Hypervigilance in irritable bowel syndrome compared with organic gastrointestinal disease. JPR 2009;66(5):399-405. Lackner JM, Gurtman MB. Patterns of interpersonal problems in irritable bowel syndrome patients: a circumplex analysis. JPR 2005;58(6):523-32. .Ålander T, Svärdsudd K, Agréus L. Functional gastrointestinal disorder is associated with increased non gastrointestinal healthcare consumption in the general population. IJCP 2008;62(2):234-40. Addolorato G, Mirijello A, D’Angelo C, Leggio L, Ferrulli A, Abenavoli L, et al. State and trait anxiety and depression in patients affected by gastrointestinal diseases: psychometric evaluation of 1641 patients referred to an internal medicine outpatient setting. IJCP 2008;62(7):1063-9. Gaylord SA, Whitehead WE, Coble RS, Faurot KR, Palsson OS, Garland EL, et al. Mindfulness for irritable bowel syndrome: protocol development for a controlled clinical trial. BMC complementary and alternative medicine 2009;9(1):24-9. Segal ZV, Williams JMG, Teasdale JD. Mindfulness-based cognitive therapy for depression: A new approach to preventing relapse. 1nd ed . New York UK:Guilford Press;2002:74-116. Wells A. GAD, Metacognition, and Mindfulness: An Information Processing Analysis. Clinical Psychology: Science and Practice 2002;9(1):95-100. Drossman DA. Functional gastrointestinal disorders: history, pathophysiology, clinical features, and Rome IV. Gastroenterology 2016;150(6):1262-79. Beck AT, Steer RA, Brown GK. Beck depression inventory-II. San Antonio 1996;78(2):490-8. Osman A, Hoffman J, Barrios FX, Kopper BA, Breitenstein JL, Hahn SK. Factor structure, reliability, and validity of the Beck Anxiety Inventory in adolescent psychiatric inpatients. JCP 2002;58(4):443-56. Beck AT, Epstein N, Brown G, Steer RA. An inventory for measuring clinical anxiety: psychometric properties. Journal of consulting and clinical psychology. 1988;56(6):893-7. Kingston J, Chadwick P, Meron D, Skinner TC. A pilot randomized control trial investigating the effect of mindfulness practice on pain tolerance, psychological well-being, and physiological activity. JPR 2007;62(3):297-300. Fjorback L, Arendt M, Ørnbøl E, Fink P, Walach H. Mindfulness Based Stress Reduction and Mindfulness Based Cognitive Therapy–a systematic review of randomized controlled trials. APS 2011;124(2):102-19. Geschwind N, Peeters F, Huibers M, van Os J, Wichers M. Efficacy of mindfulness-based cognitive therapy in relation to prior history of depression: randomised controlled trial. BJP 2012;201(4):320-5. Neff K. Self-compassion: An alternative conceptualization of a healthy attitude toward oneself. Self and identity 2003;2(2):85-101. Junkin SE. Yoga and self-esteem: exploring change in middle-aged women. (dissertation). Saskatchewan: University of Saskatchewan;2007:39-44. Bohlmeijer E, Prenger R, Taal E, Cuijpers P. The effects of mindfulness-based stress reduction therapy on mental health of adults with a chronic medical disease: a meta-analysis JPR 2010;68(6):539-44. Bishop SR. What do we really know about mindfulness-based stress reduction? Psychosomatic medicine 2002;64(1):71-83. Grossman P, Niemann L, Schmidt S, Walach H. Mindfulness-based stress reduction and health benefits: A meta-analysis. JPR 2004;57(1):35-43. Brown KW, Ryan RM. The benefits of being present: mindfulness and its role in psychological well-being. JPSP 2003;84(4):822-48. Semple RJ, Reid EF, Miller L. Treating anxiety with mindfulness: An open trial of mindfulness training for anxious children. JCP 2005;19(4):379-92.